pride in. A design can evolve along many themes, from modern contemporary garden design, to a classic symmetrical balance with focal points. 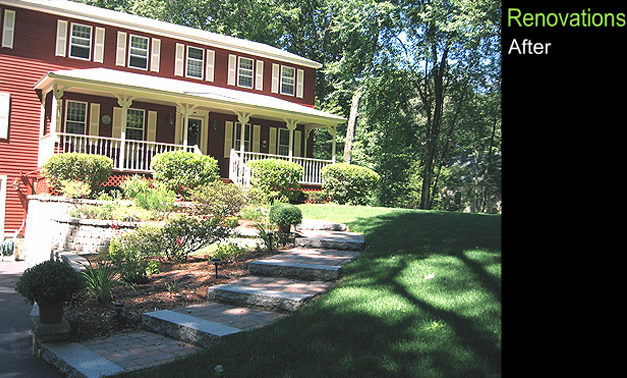 Our landscape planning tends create an organic natural style where we strive to blend your property into the native landscape to create a traditional New England look. 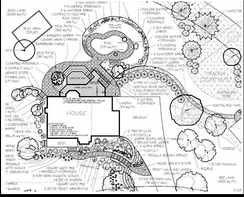 People like to be involved in landscaping their property so we approach the design process as a flow of information between us. Combining your desires with practical problem solving in a balanced composition leads to better results. 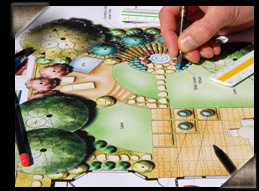 The design process begins with an introductory meeting where we tour your landscape. We can discuss and share ideas, consider your needs, the range and scope of your goals and identify design opportunities. We can then match a design approach to your project. The time and cost of a design is reflected by your goals and the complexity of the project. The savings realized by taking advantage of the opportunity to plan ahead, anticipate problems, propose solutions, and focus the budget, will typically offset the cost of the landscape designer’s fee. This is our most popular approach. 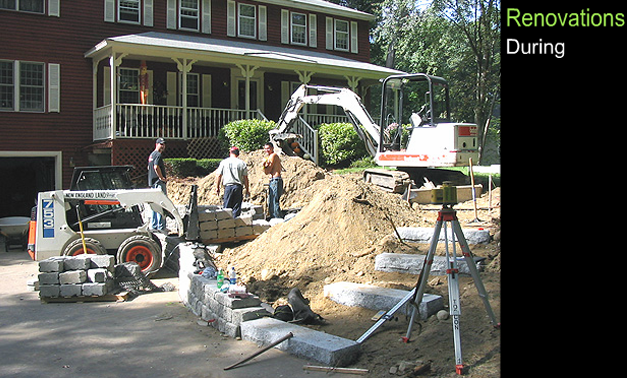 It combines the advantages of a design process with our landscape contruction experience. 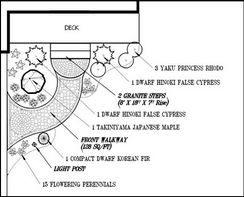 We use a survey of landscape ideas and problem solving to encourage your feedback. This helps to define your preferences and steer the project. We study and measure your property to analyze the natural conditions and collect data. We then combine these observations with your survey input to create a scaled base map. This map is the foundation for the design process and a template from which concepts are reviewed and a landscape plan is completed. To help refine the possibilities, several concepts are considered. These concepts become a discussion outline to help evaluate and consider a project. As we narrow down the ideas you end up with a plan that has evolved to meet your needs. This brainstorming phase is the most important part of the design process and may take more than one meeting. 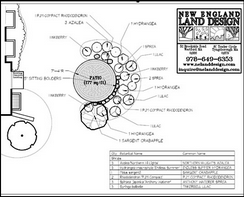 The final landscape design incorporates the ideas we have developed. 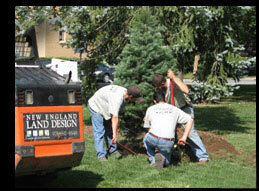 With a landscape plan, accompanying specifications and a cost estimate you will know the materials, plantings, labor and equipment needed for New England Land Design to install it. 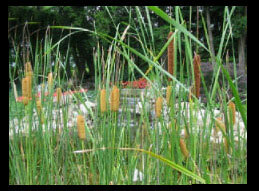 Landscape planning can restore your homes setting. Your distressed landscape may be a diamond in the rough. 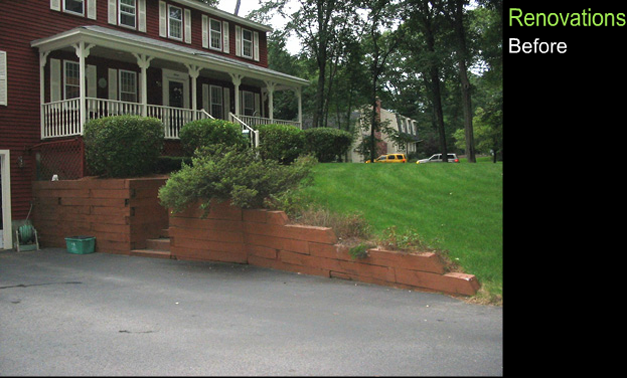 Also consider updating newer landscapes to catch small problems before they become larger. Many landscapes are struggling to reach their potential because they are difficult to maintain, are overgrown or have the wrong plants in the wrong places. Understanding how landscapes grow and change over time is critical to keeping then looking their best. We can correct long standing problems to reduce ongoing maintenance costs. Take advantage of landscape planning to increase the look beauty and value of your property. One of the things we recognize as a landscape contractor is that all landscape companies respect the value of hard work. We enjoy the satisfaction felt in finishing a hard job and hearing, Well done! 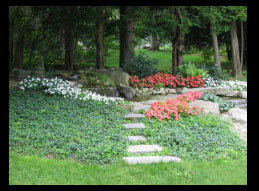 I have found that most successful landscape contractors are natural designers who do good landscaping. Good landscapers recognize the difference between a “quickie” and a “quality project”. A naturally skilled landscape contractor may not have the design background, plant knowledge or training to present their ideas in their best light. Our goal is to provide contractors associated with us a way to present a professional landscape design to help install better quality finished project. You have an idea you know your client would do if they understood it. You need to be more clear about a project a client asks you to do. We have no responsibility for quality of your installation or your project warranty. We appreciate the potential you offer for repeat business so there is a professional contractor courtesy price based on our current design catalog prices.